Signals of tissue necrosis, damage-associated molecular patterns (DAMPs), cause inflammation. Leukocytes migrating into injured tissues tonically release DAMPs, including the high mobility group box 1 protein (HMGB1). In the absence of suitable models, the relative role of DAMPs released because of necrosis or leukocyte activation has not, so far, been dissected. We have generated a mouse model lacking Hmgb1 in the hematopoietic system and studied the response to acute sterile injury of the skeletal muscle. Regenerating fibers are significantly less numerous at earlier time points and smaller at the end of the process. Leukocyte Hmgb1 licenses the skeletal muscle to react to hypoxia, to express angiopoietin-2, and to initiate angiogenesis in response to injury. Vascularization of the regenerating tissue is selectively jeopardized in the absence of leukocyte Hmgb1, revealing that it controls the nutrient and oxygen supply to the regenerating tissue. Altogether, our results reveal a novel nonredundant role for leukocyte Hmgb1 in the repair of injured skeletal muscle. Regeneration of skeletal muscle comprises the development of novel fibers and the establishment of an organized microvasculature, which sustains the metabolic requirements of the healing tissue. These processes are intermingled and strictly dependent on a functional inflammatory response (1–7). The signals that enforce this homeostatic response, which sharply differs from the inflammatory conditions associated with chronic damage and eventual wasting, have been only partially identified. High mobility group box 1 protein (HMGB1), an ancient signal of necrosis, is released upon acute cell and tissue injury (8). It is also actively secreted by activated leukocytes (9–11). A massive transient release of HMGB1 as a result of necrosis may have effects distinct from those of HMGB1 tonically released in the regenerating tissue by infiltrating leukocytes. The local concentrations achieved, the distinct source of origin, and the environmental conditions all influence the biological action of the molecule (12). HMGB1 is a redox-sensitive moiety (13–18), and redox remodeling occurs during muscle healing (19). Moreover, actively secreted HMGB1 is molecularly different from HMGB1 passively released by dying tissue, as demonstrated by its hyperacetylated C-terminal domain (20). The relative roles of tissue and leukocyte HMGB1 in regenerating tissues have not been so far clarified. Healthy skeletal muscle expresses HMGB1, which is normally localized in the nuclei of myofibers. After damage, Hmgb1 expression is upregulated in myofibers and inflammatory cells (19, 21). Hmgb1−/− mice are not viable (22). We have established a model of fetal liver progenitor transplantation to obtain mice in which Hmgb1 is absent in cells of the hematopoietic system only and have studied in these mice the homeostatic response to sterile injury. The results reveal that leukocyte Hmgb1 controls the expression of angiopoietin-2 (Ang-2), a signal required for the sprouting of growing vessels; dictates the number and area of neovessels; fosters the generation of novel myofibers; and controls the fiber size after regeneration. All procedures have been performed in accordance with Projects #371 and #522 approved by the local Institutional Animal Care and Use Committee. C57BL/6N and Ly5.1 C57BL/6 mice have been purchased from Charles River (Calco, Italy) and maintained in the specific pathogen–free facility of San Raffaele Scientific Institute (Milan, Italy). Hmgb1+/− mice are on a C57BL/6 Ly5.2 background, and the colony has been maintained in the same specific pathogen–free facility. The health of the mice has been monitored daily during the experimental phase. Weight loss, fur status, and kyphosis have been evaluated. If a weight loss >20% of the initial weight is recorded, mice are humanely culled. Survival after transplantation has been routinely >90%. No major side effect has arisen during the observation period. Hmgb1+/− mice have been crossed. Fetuses have been retrieved at day 14.5 and livers isolated. Livers have been mechanically dissociated to obtain a single-cell suspension, and isolated cells have been injected into lethally irradiated (900 rad) wild-type mice. After 6 wk, chimerism has been verified by flow cytometry (see below). After 10 wk from the time of transplantation, muscles have been damaged and the characteristics of the healing process monitored by flow cytometry (19) or immunohistochemistry, as below. PCR has been performed on DNA extracted from ear biopsy specimens. Primers used for genotyping are the following: hmgb1 forward: 5′-GCA GGC TTC GTT GTT TTC ATA CAG-3′; hmgb1 reverse: 5′-TCA AAG AGT AAT ACT GCC ACC TTC-3′; neo forward: 5′-TGG TTT GCA GTG TTC TGC CTA GC-3′; neo reverse: 5′-CCC AGT CAT AGC CGA ATA GCC-3′. Magnetic resonance imaging (MRI) acquisition has been performed using a 7-T horizontal 30-cm bore, 300.3-MHz unit (BioSpec 70/30 USR, ParaVision 5.0; Bruker BioSpin, Karlsruhe, Germany) (23). Cardiotoxin (50 μl, 10 μM; Sigma-Aldrich, Germany) has been injected into tibialis anterior (TA) muscles, and damage and regeneration assessed as described (24, 25). When indicated, BoxA (10 μg/TA; HMGBiotech, Milan, Italy) has been coinjected with cardiotoxin and the treatment repeated every other day. Muscle sections have been prepared and stained for CD45.2 expression with a rat anti-mouse CD45.2 (BD Biosciences) and for CD68 with a rat anti-mouse CD68, as described (AbD Serotec) (25). In selected experiments, muscles have been dissociated by enzymatic digestion and the characteristics of the infiltrate assessed by flow cytometry (19) or Western blotting (21). Muscle RNA has been analyzed by quantitative PCR using SYBRgreen PCR Master Mix (Applied Biosystems, Life Technologies Europe), as described (25). Muscle sections have been prepared and stained for CD31 expression with a rat anti-mouse CD31 (clone MEC13.3; BD Biosciences), as described (25). Pictures have been captured with a digital sight DS-5M digital camera (Nikon), using LuciaG Software (Laboratory Imaging). For quantitative PCR, muscle RNA has been analyzed using SYBR Green PCR Master Mix (Applied Biosystems, Life Technologies Europe), as described (25). Primers used have been the following: hif1α (forward: 5′-TCA AGT CAG CAA CGT GGA AG-3′; reverse: 5′-TAT CGA GGC TGT GTC GAC-3′); vegfß (forward: 5′-CCT GGA AGA ACA CAG CCA AT-3′; reverse: 5′-GGA GTG GGA TGG ATG ATG TC-3′); ang2 (forward: 5′-CAC AGC GAG CAG CTA CAG TC-3′; reverse: 5′-ATA GCA ACC GAG CTC TTG GA-3′); glut1 (forward: 5′-GCT GTG CTT ATG GGC TTC TC-3′; reverse: 5′-AGA GGC CAC AAG TCT GCA TT-3′); CaIX (forward: 5′-GGA GTC CCT TGG GTT AGA GG-3′; reverse: 5′-GAT GTC TAC CGG GGA CTG AA-3′). Bone marrow–derived macrophages and satellite cells have been isolated and propagated as described (24, 26) and cocultured at 1:1 ratio into Matrigel-coated plates for 48 h. Interaction outcomes have been assessed as described (24). Data have been expressed as the mean ± SD. Statistical analysis has been performed using the Student t test for unpaired data or one-way ANOVA followed by a Dunnett or Newman–Keuls post hoc test, when appropriate. The p values < 0.05 have been considered statistically significant (GraphPad Prism, v. 4.0 Software). To investigate the role of leukocyte Hmgb1, we have produced mice selectively lacking Hmgb1 in the hematopoietic system. Heterozygous Hmgb1+/− CD45.2 mice have been crossed. At day E14.5 of pregnancy, females have been sacrificed and fetal liver cells transplanted into Hmgb1+/+ lethally irradiated CD45.1 recipients. Both Hmgb1-proficient (Hmgb1+, including Hmgb1+/+ and Hmgb1+/−) and -deficient (Hmgb1−, i.e., Hmgb1−/−) fetal liver cells are an effective source of hematopoietic precursors (Supplemental Figs. 1–3), whereas irradiation per se does not affect muscle repair and infiltration of immune cells (Supplemental Fig. 2). Full donor chimerism is reached in the peripheral blood, bone marrow, and secondary lymphoid organs of Hmgb1− and Hmgb1+ mice that have undergone fetal liver transplantation (FLT) (Supplemental Fig. 1 and Supplemental Fig. 3, respectively). Circulating leukocytes of Hmgb1− FLT mice express negligible amounts of Hmgb1. Hmgb1 expression in the muscles of FLT mice, most likely produced by tissue-resident cells, is very limited before injury. The extent of Hmgb1 expression does not significantly change in Hmgb1− FLT mice upon injury and regeneration. In sharp contrast, Hmgb1 expression is dramatically higher after injury in the muscles of Hmgb1+ FLT mice (Supplemental Fig. 1). We have evaluated the response of Hmgb1− and Hmgb1+ FLT mice to sterile injury of the skeletal muscle. Injured TA muscles of Hmgb1− FLT mice have a significantly lower number of centrally nucleated fibers (Fig. 1A, 1B), indicating that regeneration is jeopardized. The TA cross-sectional area of regenerating fibers in the absence of leukocyte Hmgb1 is significantly smaller (Fig. 1A–C). Lipids selectively accumulate in the perimysial areas of Hmgb1− FLT mice, as detected by Oil Red histochemistry (Fig. 1A). Leukocyte Hmgb1 influences the homeostatic response to sterile injury. In the absence of leukocyte Hmgb1 (Hmgb1− FLT), TA regeneration is defective at day 7 [(A) top panel and (B)] and at day 15 [(A) middle panel and (C)] after injury, as assessed by counting centrally nucleated fibers (B), by assessing the fiber diameter (cross-sectional area, x axis, C) after H&E staining, and by revealing lipid accumulation using Red Oil O staining [(A) bottom panel]. Ten successive slices have been analyzed for each mouse (n = 3). (D and E) FA in injured TAs of Hmgb1+ and Hmgb1− FLT mice has been assessed by MRI (n = 7). Original magnification ×10. *p < 0.05, **p < 0.01. The regeneration defect might involve various events: extent of necrosis induction, characteristics of the inflammatory response and the muscle stem cell activation, proliferation, and differentiation. The extent of necrosis has been investigated noninvasively by longitudinal MRI of injured TA muscles. Fractional anisotropy (FA), an MRI parameter that reflects the direction of intracellular water molecules in a tissue, is similar in the presence or absence of leukocyte Hmgb1 (Fig. 1D, 1E). Muscle is organized in fibers; hence, the preferential direction of water is orthogonal to the axial plan (blue). If the tissue is damaged, fibers lose their integrity, and as a consequence the molecules of water diffuse randomly (black). Therefore, using FA we are able to give information about muscle architecture (23). As such, the sensitivity of muscle to injury is apparently not involved in the establishment of the phenotype described. The inflammatory response to myofiber death in the absence of leukocyte Hmgb1 could change. T2 relaxation time, the MRI parameter used to quantify edema (23), is similar in Hmgb1+ and Hmgb1− FLT mice after injury. This suggests that leukocyte Hmgb1 does not influence the extent or the kinetics of edema formation (Fig. 2A, 2B). Most infiltrating cells are of donor origin (CD45.2+) in both Hmgb1+ and Hmgb1− FLT mice (Fig. 2C), and the extent of infiltration by macrophages, T and B lymphocytes, and NK cells is similar (Fig. 2D). Infiltrating macrophages, retrieved from injured muscles and analyzed by flow cytometry, express similar amounts of activation/polarization markers (Fig. 2E). Tissue edema and infiltration are independent of leukocyte Hmgb1. (A and B) Relaxation time (T2rt) from T2 Map sequence has been assessed in TAs of Hmgb1+ and Hmgb1− FLT mice by MRI analysis (n = 7) at various times after injury. (C–E) TA-infiltrating cells have been retrieved and analyzed by flow cytometry at day 7 after damage. Most leukocytes express the CD45.2 marker and are of donor origin [(C), n = 3], and their overall lineage composition [(D), n = 3] or expression of macrophage activation/polarization markers [(E), n = 3)] is similar in Hmgb1+ and Hmgb1− FLT mice. The similar efficiency of macrophage recruitment has been surprising because Hmgb1 is a potent chemotactic signal for leukocytes. We hypothesized that the early leukocyte recruitment, which occurs in the presence or absence of leukocyte Hmgb1, could be ascribed to Hmgb1 derived from necrotic myofibers, which is generated acutely and transiently. We have thus evaluated the effect of BoxA, a competitive antagonist that blocks the action of extracellular Hmgb1 independently of the source. At day 7 the edema is significantly decreased in BoxA- versus sham-treated injured TA muscles (Supplemental Fig. 4A). The recruitment of CD45+CD11b+ macrophages is selectively reduced in BoxA-treated mice (Supplemental Fig. 4B). Macrophage Hmgb1 could directly activate satellite cells or act by modulating independent environmental signals. Macrophages propagated in vitro from Hmgb1+ and Hmgb1− bone marrow precursors appear virtually identical because they express similar amounts of cell surface markers and produce comparable amounts of soluble signals (Supplemental Fig. 4C–E). Not surprisingly they are similarly effective at modulating the differentiation of satellite cells (Fig. 3A, Fig. 3B, respectively). BoxA does not interfere with satellite cell differentiation (not shown) and has no effect on satellite cells challenged with Hmgb1+ macrophages (Fig. 3B). The results make it unlikely that macrophage Hmgb1 has a direct effect on satellite cells. In vitro satellite cell differentiation is independent of macrophage Hmgb1. Satellite cells have been propagated in vitro and cultured in the presence of 5% horse serum (HS, positive control), of 20% hyclone (negative control), or at a 1:1 ratio with M2 macrophages from Hmgb1+ or Hmgb1− FLT mice (A) or with Hmgb1+ M2 macrophages in the presence or absence of the Hmgb1 competitive inhibitor BoxA (n = 6) (B). Histograms report on the y-axis the quantification of the number of myosin H chain+ (MyHC+) myotubes displaying 1 nucleus (open), 2–4 nuclei (light gray), or > 5 nuclei (dark gray), respectively. The inflammatory response that culminates in effective regeneration licenses satellite cells to undergo activation, proliferation, and fusion (24, 27, 28). The expression of pax7 and myoD genes, markers of quiescent and activated satellite cells, respectively, is comparable in the two groups of mice (Fig. 4A, 4B). 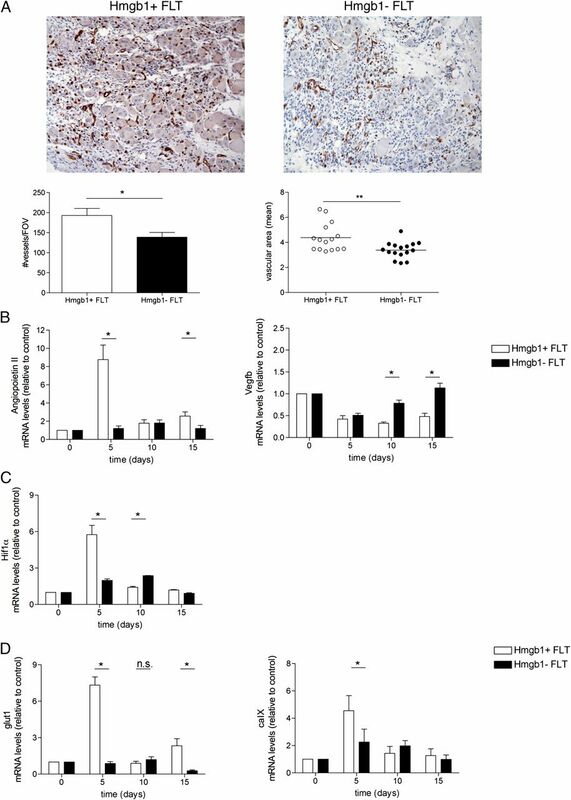 Myogenin, which is preferentially expressed by differentiating satellite cells, and insulin-like growth factor 1 (Igf1), which is involved in satellite cell differentiation, in the absence of leukocyte Hmgb1 are significantly less expressed early after injury (Fig. 4C, 4D). Leukocyte Hmgb1 thus plays a nonredundant role in the differentiation of satellite cells, but this is unlikely to occur through direct interaction between the two cell populations. Leukocyte Hmgb1 licenses satellite cells for expression of myogenin and insulin-like growth factor (Igf1). TA expression of Pax7 (A), myogenin (B), MyoD (C), and Igf1 (D) has been evaluated by RT real-time PCR in Hmgb1+ and Hmgb1− FLT mice at various times after injury (x axis). *p < 0.05. The formation of novel vessels ensures oxygen and nutrient supply during wound healing (29), is known to be influenced by Hmgb1 (30), and could in turn modulate the sensitivity of satellite cells to activation. We have analyzed angiogenesis in regenerating muscles in the presence or the absence of leukocyte Hmgb1. Vessel number and the total vascular area have been significantly greater in the presence of leukocyte Hmgb1 (Fig. 5A). The Ang-2 mRNA levels are at early time points dramatically higher in the presence of leukocyte Hmgb1 (Fig. 5B). At this time point, vascular endothelial growth factor (Vegf) mRNA is expressed at comparable levels in the two groups of mice (Fig. 5B). Leukocyte Hmgb1 licenses regenerating muscle for expression of Ang-2 and angiogenesis. (A) Immunohistochemical analysis of CD31+ endothelial cells in TA from Hmgb1+ FLT (left panel) and Hmgb1− FLT (right panel) 7 d after injury, revealed by ABC-HRP (orginal magnification ×10). The number of vessels per field of view and the vascular area have been calculated by digital image analysis. Data are expressed as mean ± SEM of results obtained in three independent experimental and control mouse pairs. (B) Ang-2 (left panel) and Vegfb (right panel) mRNA expression has been assessed in Hmgb1+ and Hmgb1− FLT mice before and at various time points after damage. (C) Hif1α mRNA (expression has been assessed in Hmgb1+ and Hmgb1− FLT mice before and at various time points after damage). (D) Hif1α target genes Glut1 (left panel) and CaIX (right panel) mRNA expression has been assessed in Hmgb1+ and Hmgb1− FLT mice before and at various time points after damage. *p < 0.05, **p < 0.01. Ang-2 expression fails to increase in the absence of leukocyte Hmgb1 throughout all the regeneration process, whereas Vegf expression increases at later time points. In the presence of Vegf, but in the absence of Ang-2, endothelial precursors proliferate but endothelial sprouts fail to assemble (31). Angiogenesis plays a key role in the regeneration of injured skeletal muscles. Even if the molecular signals involved in the activation of angiogenesis, which comprises Ang-2 induction, are only partially understood, activation of the hypoxia inducible factor 1a (Hif1a) pathway plays a role. 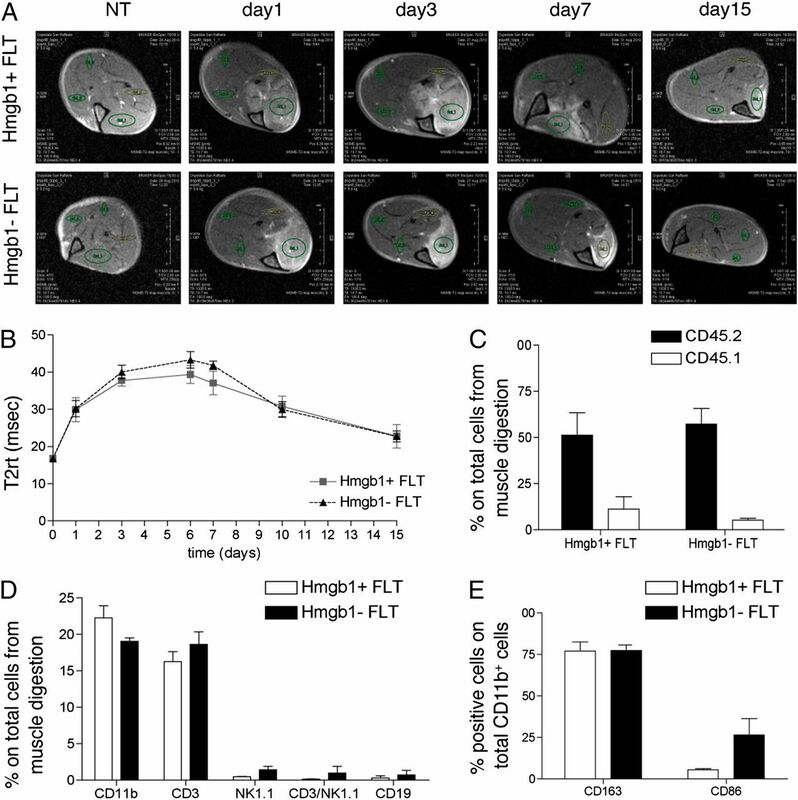 Hif1a gene expression is dramatically reduced in the muscle of Hmgb1− FLT mice at day 5 after damage (Fig. 5C). Hif1a target genes, caIX and glut1, are in parallel reduced (Fig. 5D). The results confirm that in the absence of leukocyte Hmgb1, the injured muscle is apparently unable to perceive or to react to the hypoxic state associated with tissue damage and inflammation. In this study we make two significant observations. First, leukocyte Hmgb1 is required for and controls the efficacy of muscle repair. Second, the absence of leukocyte Hmgb1 jeopardizes vessel remodeling in the injured tissue, suggesting that infiltrating leukocytes control the regeneration of vasculature, and, as such, set the appropriate scenario for muscle stem cell proliferation and differentiation. To address this issue, we have relied on an ad hoc model in which leukocyte Hmgb1 is specifically targeted. We do not observe in basal conditions substantial changes in leukocyte homeostasis, suggesting that Hmgb1 expression is dispensable for leukocyte development, activation, and differentiation. In contrast, leukocyte Hmgb1 expression plays a nonredundant role in inflammatory conditions. This observation fits well with recent results obtained by ablating the molecule in myeloid cells of Hmgb1-floxed [Hmgb1(f)(/f)] mice (32): mice normally develop but are exquisitely sensitive to endotoxin shock and bacterial infection. Hmgb1 is released acutely because of muscle necrosis. This corresponds to a wave of inflammatory cell recruitment and tissue edema. However, our data indicate that infiltrating cells deliver Hmgb1 at the site of damage, where it orchestrates a second wave of events that comprises muscle repair and vessel remodeling. This is likely to be associated with the response to the hypoxic microenvironment linked with tissue necrosis. Several reasons could underlie these distinct Hmgb1 actions, including its relative concentration, timing, and localization. Tissue Hmgb1 is massively released, being transiently detectable in the blood of damaged mice (19, 21). The initial massive release could be responsible for leukocyte attraction at the site of damage, as shown by the reduced attraction of macrophages upon extracellular Hmgb1 pharmacological blockade. Previous data suggest that Hmgb1 is chemotactic within a specific range of concentrations (33). It is conceivable that only the Hmgb1 released upon muscle damage reaches concentrations that trigger inflammatory cell migration. Tissue Hmgb1 is passively released within a few hours and up to 1 d after damage induction, whereas the leukocyte Hmgb1 secretion within the injured skeletal muscle is sustained throughout the whole repair process (19, 21). Similarly, passively released Hmgb1 acts as an early endogenous trigger of inflammation and organ damage in hepatic ischemia–reperfusion injury (34) and as a late mediator of endotoxin lethality in sepsis (35). Timing is critical to switch off angiogenesis, allowing vessel stabilization (36, 37). The disappearance of leukocytes, when muscle repairs, could represent such a “switch off” signal. Leukocyte Hmgb1 would cease at a time in which vessels need stabilization instead of remodeling. The issue of localization is strictly related. Infiltrating phagocytes localize in close proximity with dying fibers and contribute to their clearance. Satellite cells are located between the sarcolemma and the basal lamina (2) and need oxygen and nutrient supply to proliferate, differentiate, and ultimately heal the muscle. Specifically, satellite cells are located in close proximity to blood vessels regardless of their activation and differentiation state (38), and their proliferation and differentiation start simultaneously with the formation of new capillaries in regenerating muscle (39). Therefore, tissue damage and the ensuing hypoxia due to disruption of the vasculature generate signals that recruit and orient nascent, sprouting vessels. Leukocyte Hmgb1 could be involved because it is produced at the correct location and in the appropriate time window. Our data indicate that leukocyte Hmgb1 plays a nonredundant role in the ability of the skeletal muscle to react to the hypoxic environment, inducing hypoxia-related responses and Ang-2 expression. Previous reports indicate a role for Hmgb1 in the proliferation and migration of endothelial cells in vitro (30) and in vascular bed remodeling in models of ischemia–reperfusion injury (40) (41). Little is known about the relationship between Hmgb1 and Hif1a (42–44). Further studies are required to better delineate the interaction, verifying in particular whether MAPK is involved (45–47) and whether oxygen sensing in endothelial cells or stromal cells is modified in the absence of leukocyte Hmgb1. The authors have no financial conflicts of interest. However, M.E.B. is founder and part owner of HMGBiotech, a company that provides goods and services related to HMGB proteins. We thank A. Capobianco, L. Bosurgi, N. Maugeri, G. Corna, M. Vezzoli, and I.R. Caserta for support and enjoyable discussion and the staff of ALEMBIC, an advanced microscopy laboratory established by the San Raffaele Scientific Institute and the Vita-Salute San Raffaele University, for InCell Analyser data. L.C. conducted this study in partial fulfillment of a Ph.D. degree in Cellular and Molecular Biology, San Raffaele University, Milan, Italy, and The Open University, Milton Keynes, U.K. This work was supported by the European Community’s framework programme FP7/2007–2013 under Grant Agreement n1 241440(ENDOSTEM) (to P.R.-Q. ); the Italian Ministry of Health (Fondo per gli Investimenti della Ricerca di Base-IDEAS to P.R.-Q. and Ricerca Finalizzata 2009 to P.R.-Q, M.E.B., and A.A.M. ); the Associazione Italiana Ricerca sul Cancro (Grant AIRC IG11761 to A.A.M. ); the Association Francaise contre les Myopathies (Grant 15440 to P.R.-Q. ); and the Italian Ministry of University and Research (Grant PRIN 2010–11 to A.A.M.).
. 2004. Cellular and molecular regulation of muscle regeneration. Physiol. Rev. 84: 209–238.
. 2007. Skeletal muscle satellite cells and adult myogenesis. Curr. Opin. Cell Biol. 19: 628–633.
. 2005. Cellular and molecular signatures of muscle regeneration: current concepts and controversies in adult myogenesis. Cell 122: 659–667.
. 2012. IL-10 triggers changes in macrophage phenotype that promote muscle growth and regeneration. J. Immunol. 189: 3669–3680.
. 2013. Macrophage plasticity and the role of inflammation in skeletal muscle repair. Mediators Inflamm. 2013: 491497.
. 2013. Monocyte/macrophage interactions with myogenic precursor cells during skeletal muscle regeneration. FEBS J. 280: 4118–4130.
. 2013. Type 2 innate signals stimulate fibro/adipogenic progenitors to facilitate muscle regeneration. Cell 153: 376–388.
. 2007. High-mobility group box 1 (HMGB1) protein at the crossroads between innate and adaptive immunity. Immunol. Rev. 220: 35–46.
. 2012. Novel role of PKR in inflammasome activation and HMGB1 release. Nature 488: 670–674. 2009. HMGB1 loves company. J. Leukoc. Biol. 86: 573–576.
. 2009. Requirement of HMGB1 for stromal cell-derived factor-1/CXCL12-dependent migration of macrophages and dendritic cells. J. Leukoc. Biol. 86: 609–615.
. 2012. Redox modification of cysteine residues regulates the cytokine activity of high mobility group box-1 (HMGB1). Mol. Med. 18: 250–259.
. 2013. The many faces of HMGB1: molecular structure-functional activity in inflammation, apoptosis, and chemotaxis. J. Leukoc. Biol. 93: 865–873. 2013. The translocation of nuclear molecules during inflammation and cell death. Antioxid. Redox Signal. 20: 1117–1125.
. 2014. Redox modulation of HMGB1-related signaling. Antioxid. Redox Signal. 20: 1075–1085.
. 2010. Redox remodeling: a candidate regulator of HMGB1 function in injured skeletal muscle. Ann. N. Y. Acad. Sci. 1209: 83–90.
. 2011. High-mobility group box 1 release and redox regulation accompany regeneration and remodeling of skeletal muscle. Antioxid. Redox Signal. 15: 2161–2174.
. 1999. The lack of chromosomal protein Hmg1 does not disrupt cell growth but causes lethal hypoglycaemia in newborn mice. Nat. Genet. 22: 276–280.
. 2013. Magnetic resonance imaging at 7T reveals common events in age-related sarcopenia and in the homeostatic response to muscle sterile injury. PLoS ONE 8: e59308.
. 2012. Transplanted mesoangioblasts require macrophage IL-10 for survival in a mouse model of muscle injury. J. Immunol. 188: 6267–6277.
. 2013. Requirement of inducible nitric oxide synthase for skeletal muscle regeneration after acute damage. J. Immunol. 190: 1767–1777.
. 2009. Macrophages are alternatively activated in patients with endometriosis and required for growth and vascularization of lesions in a mouse model of disease. Am. J. Pathol. 175: 547–556.
. 2007. Inflammatory monocytes recruited after skeletal muscle injury switch into antiinflammatory macrophages to support myogenesis. J. Exp. Med. 204: 1057–1069.
. 2008. The immune system and the repair of skeletal muscle. Pharmacol. Res. 58: 117–121.
. 2012. Critical role of hypoxia sensor—HIF-1α in VEGF gene activation. Implications for angiogenesis and tissue injury healing. Curr. Med. Chem. 19: 90–97.
. 2006. Cutting edge: extracellular high mobility group box-1 protein is a proangiogenic cytokine. J. Immunol. 176: 12–15.
. 2006. Angiopoietins: a link between angiogenesis and inflammation. Trends Immunol. 27: 552–558.
. 2013. Conditional ablation of HMGB1 in mice reveals its protective function against endotoxemia and bacterial infection. Proc. Natl. Acad. Sci. USA 110: 20699–20704.
. 2007. High mobility group box-1 protein induces the migration and activation of human dendritic cells and acts as an alarmin. J. Leukoc. Biol. 81: 59–66.
. 2005. The nuclear factor HMGB1 mediates hepatic injury after murine liver ischemia-reperfusion. J. Exp. Med. 201: 1135–1143.
. 1999. HMG-1 as a late mediator of endotoxin lethality in mice. Science 285: 248–251.
. 2011. Endothelial development taking shape. Curr. Opin. Cell Biol. 23: 676–685.
. 2007. Endothelial signalling by the Notch ligand Delta-like 4 restricts angiogenesis. Development 134: 839–844.
. 2010. Regulation of myogenic stem cell behavior by vessel cells: the “ménage à trois” of satellite cells, periendothelial cells and endothelial cells. Cell Cycle 9: 892–896.
. 2003. Angiogenesis and myogenesis as two facets of inflammatory post-ischemic tissue regeneration. Mol. Cell. Biochem. 246: 57–67.
. 2007. High-mobility group box 1 activates integrin-dependent homing of endothelial progenitor cells. Circ. Res. 100: 204–212.
. 2012. Exogenous high-mobility group box 1 protein injection improves cardiac function after myocardial infarction: involvement of Wnt signaling activation. J. Biomed. Biotechnol. 2012: 743879.
. 2013. Hypoxia markers are expressed in interneurons exposed to recurrent seizures. Neuromolecular Med. 15: 133–146.
. 2013. β-Defensin-3 negatively regulates TLR4-HMGB1 axis mediated HLA-G expression in IL-1β treated glioma cells. Cell. Signal. 25: 682–689.
. 2011. 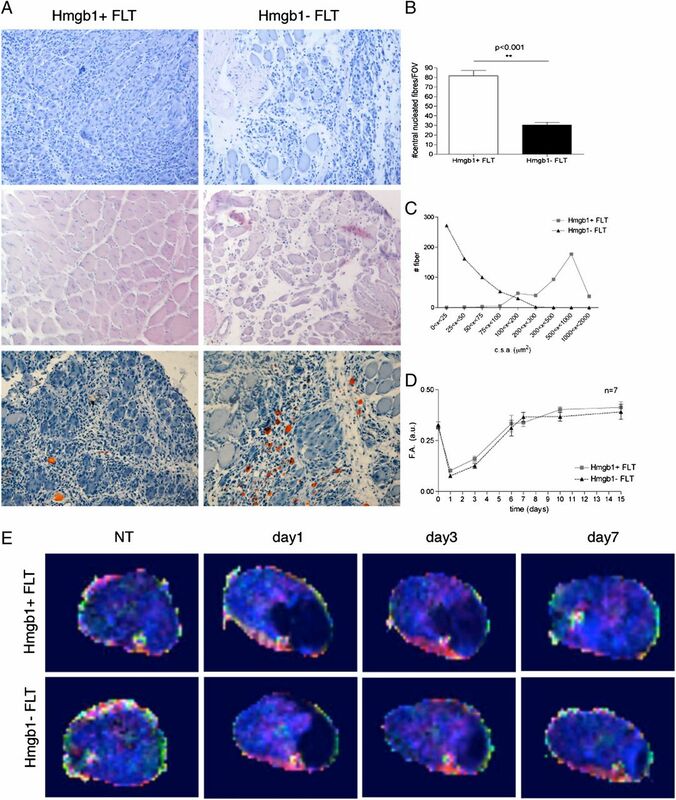 Hypoxia-increased RAGE and P2X7R expression regulates tumor cell invasion through phosphorylation of Erk1/2 and Akt and nuclear translocation of NF-kappaB. Carcinogenesis 32: 1167–1175.
. 2000. The Kaposi’s sarcoma-associated herpes virus G protein-coupled receptor up-regulates vascular endothelial growth factor expression and secretion through mitogen-activated protein kinase and p38 pathways acting on hypoxia-inducible factor 1alpha. Cancer Res. 60: 4873–4880.
. 1999. p42/p44 mitogen-activated protein kinases phosphorylate hypoxia-inducible factor 1alpha (HIF-1alpha) and enhance the transcriptional activity of HIF-1. J. Biol. Chem. 274: 32631–32637.
. 2006. Hypoxia-inducible factor-1 (HIF-1). Mol. Pharmacol. 70: 1469–1480.